Hope you all are having a great week so far. 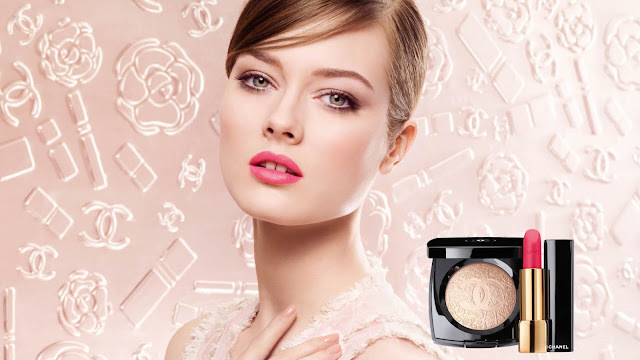 Chanel has launched its make-up collection for Spring 2013 'Collection Printemps Precioux De Chanel' worldwide and in India recently. I was very intimidated by this collection and was desperately waiting for it's launch in India. The collection was officially launched in India on 15th January 2013, but, I got the chance to see the collection today after a week of its launch. Hence, a quick post about the collection. The collection includes precious pinks and plums for lips and nails to awaken the vibrancy of Spring and a palette inspired by Gabrielle 'Coco' Chanel's codes of sophistication and simplicity. I liked most of the stuff from the collection, especially the highlighter is chef-d'oeuvre del'art i.e. master piece of art. It has the Chanel logo and Chanel's signature products embossed on it. Loved the luxurious pouch packaging of the powder. Of the entire collection I picked up this Illuminating Powder for INR 3700/- and Rouge Allure Extrate De Gloss in Merveille for INR 2100/-. I will this post with some more pictures of the illuminating powder, to show how it looks is broad day light. Couldn't wait to share the excitement of owning the master piece of art and hence this quick post. Have had a chance to have a look at the collection? What are planning to buy from this collection. Wow...those are some gorgeous pieces u picked..I got the Frivole blush and its amazing...Nice collection...waiting for the detailed review and some looks. Frivole is a lovely shade, but sadly it didn't show up on me. So, decided to skip it. Hi Eesha! Landed on your blog searching for a MAC lipstick review (Plumful)..not sure if you are the same Eesha who had left a comment on my blog earlier! Hi Rads... yes, I commented on your blog that day. Hope the plumful review was of some help to you. It most definitely was! I find it so difficult to figure out colors from online swatches - a lot of times the photos are just so blurred and useless or so obviously not the right color..and other times the skin tone is just not something I can relate to. Your review was just perfect for me...I only hope it looks just as nice on me! Oh..and I absolutely love your blog and it's on my Google Reader now so I don't miss out on updates :D I don't comment anywhere much because I rarely have the time to - I know it sounds really silly considering you work a full-time job yourself - but I do love reading makeup and beauty blogs, especially ones that actually have reviews of products I myself would love to try. I hope you figure out a way to do makeup videos (was reading your Know Me page cos I was curious :P)..and I want to to try Hakuhodo too. I just wish there was some place I could actually see the brushes before buying, not just photos!